LayerSlider Plugin ($17 value) — We’ve went ahead and made is easy for you to setup a slick looking slider in Kudos BuddyPress theme. LayerSlider plugin comes bundled with Kudos for free, a $17 value. Dress up your site without spending extra. Retina & HDPI Ready — Whether you are viewing Kudos WordPress theme on a Retina device, a HDPi device, or even a XHDPi, rest assured your site will display brilliantly at optimal resolution. Kudos uses no bitmap based images. Responsive — Whatever the device, Kudos BuddyPress theme is up for the task. We don’t just set breaking points, we scale the content, so that not matter which device, your content will always look beautiful. Post Formats — Dressing up your blog posts has never been more easier and fun. 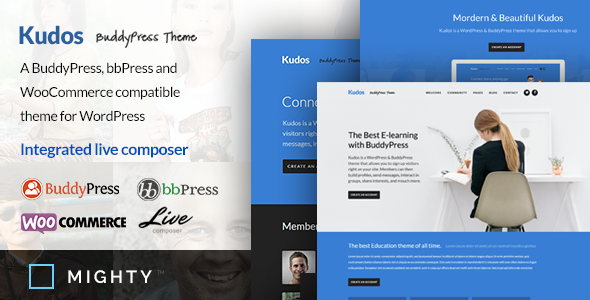 Kudos BuddyPress theme offers support for many popular post formats, including: links, quotes, gallery, audio and video (both self-hosted and third-party). SEO (Search Engine Optimization) — We’ve really gone the extra mile with SEO in Kudos. Not only have we integrated all of the standard best practices, but we’ve went ahead and implemented all modern HTML5 and Schema.org recommendations. BuddyPress Compatibility — Compatible and tested to play nice with the latest version of BP. bbPress — Integrated and tested to display your bbPress forums within the theme.